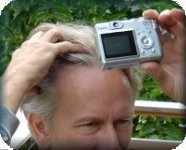 The sooner a man with male pattern hair loss seeks treatment, the better. In a study of one set of identical twins with the same hair loss and medical history, the twin who got treated faster had significantly more hair four years later than his brother. The first twin used an effective topical type I 5-alpha reductase inhibitor in combination with minoxidil and oral finasteride; a type II 5-alpha reductase inhibitor for four years. The second twin did not receive the treatment until a year after his brother started, due to an unforeseen event. His hair loss progressed. This man’s hair loss was irreversible, despite receiving the same, typically-effective treatment for three years. The study questioned the ethics of delaying treatment for participants in scientific research on hair loss, or giving them a placebo. Given that immediate treatment is more effective, treatment should be offered without delay, according to the researchers. “If you are experiencing hair loss, seek treatment now,” said Dr. Shapiro, a dermatologist in Southern Florida who works exclusively with hair transplant surgery. The study was conducted by Hugh Rushton, Ian Ramsay, Jeremy Gilkes; School of Pharmacy & Biomedical Sciences, University of Portsmouth, Portsmouth, Lister Hospital, London, UK and presented at the European Hair Research Society annual conference. This entry was posted in Baldness, Hair Health, Hair Loss, Hair Loss in Women, Hair Problems, Hair Transplants on July 5, 2009 by Larry Shapiro.